The powerful Triflow Blowers offer outstanding vacuum for water restoration, dual wand operation, and long hose runs. The standard Pre-filter box allows for easy clean up between jobs without opening the waste tank. With the 12 Volt power outlet you can plug in a floodlight so you can keep working even during hydro power outages. The Exhaust Detector keeps exhaust off operator and out of vehicle. The Auto Chemical Prime automatically primes the chemical system making set up easy. The Chemical Simulator simulates chemical flow without using the trigger wand to easily switch between chemicals. Hot Water Tap allows you to fill your chemical jug with hot water to improve chemical performance. Shutdown Identifiers allow you to diagnose the cause of shutdown to correct the problem limiting downtime. Console Light allows easy to read control panel to be illuminated at night. The Prochem Everest Truckmount 650 is Prochem's most powerful and durable truckmount featuring the Hyundai 1.6 liter 68 HP/3600 RPM engine. 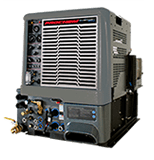 While it is engineered to meet the needs of large-scale commercial applications, its versatility provides great value even if your business is focused on residential applications. The HP models allow you to extend your carpet cleaning business and service calls to incorporate high-pressure cleaning of decks, exterior brick, tile and even transports and other commercial vehicles.